Display, decant, and pour your next bottle of wine in dramatic fashion inside the tight serpentine coils of this cool new Riedel Boa Wine Decanter. 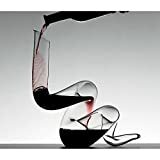 Place this snakelike decanter in the center of the table during your next dinner party or holiday gathering, pour in a bottle of wine, and watch as it aerates it as it flows down through the coiled curves. It then double decants when later poured back out into a glass. Each decanter is handmade in Austria from the finest lead crystal for maximum clarity and holds up to 69 oz of your finest vino. 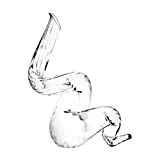 Best of all, this boa constrictor won't crush you or your guests and sculpturally interesting enough to be put on display when not in use.